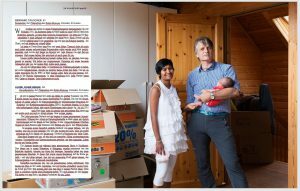 We are Gerhard Tauscher and Luvini Ranasinghe, a couple working in the humanitarian field for quite some time. So thanks to our work, we get to travel the world. Often to darkest corners of the world, where no one else would go. Gerhard, a paramedic back at home by profession, has been working in many humanitarian roles in different disasters of the last 2 decades. Luvini, a journalist back at home, has been working in reporting and communications in humanitarian operations since the Indian Ocean Tsunami of 2004. Now you all know who we are. The question is what is ‘All over the world’. This is a first step towards a web site we have been dreaming of creating as a couple, on our life’s’ encounters. The blog is the plat form for us to share our experiences in forms of photos, stories, posts, books and simple articles. Gerhard is a nature lover, specifically a bird lover, so this is the platform to showcase some 200 species of birds he has photographed during years. Luvini a writer will use the blog to upload her latest writing adventures. The blog will also post various encounters of our humanitarian missions around the world. It will capture our interesting holidays, adventure in nature and last but not least our favorite recipes.